A man who was caught by Hounslow Council’s enforcement team twice illegally dumping rubbish in the borough, has been fined £800. CCTV cameras had picked up the man, who is from Hackney, was emptying cardboard boxes at the rear of High Street, Hounslow in October and November last year. The same person was captured leaving the High Street in a vehicle which the Council’s enforcement team traced to a lease company. The company were served with a notice to provide the keepers details at the time of the alleged offence which resulted in the identification of the perpetrator. After identifying the man, enforcement officers served two Fixed Penalty Notice [FPN’s] of £400 each for fly-tipping. Councillor Hanif Khan, Cabinet Member for Community Protection and Enforcement, Hounslow Council, said: “We will continue to come down strong on those who think they can just dump rubbish in our streets and get away with it. “It doesn’t matter whether you are a resident or not, we won’t stand for it and we will track down those who are responsible. Fly-tipping is an anti-social behaviour that is blighting the lives of our residents and is also costly to the Council to clear up. 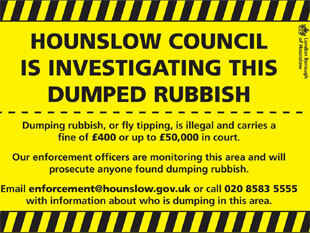 • If you have evidence of fly-tipping, or know who is responsible for dumping in your area contact Hounslow Council.